Unpredictably harsh elements wreaked havoc in Orange County during the Great Depression. The 1933 Long Beach earthquake claimed 115 lives, shattering lands eastward across the Los Angeles County line into the Orange County cities. Then 60 people perished in the devastating 1938 Santa Ana River flood, which washed out roads and buildings and much of the county's namesake citrus industry. 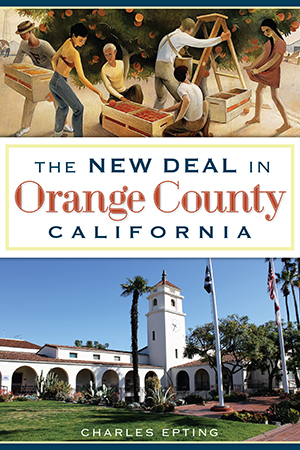 Orange County's 130,000 people received a greater density of federal public aid than LA County's 2.2 million and San Diego County's 210,000. Join Charles Epting on this tour of the buildings, bridges, harbors, trails, libraries, highways and other infrastructure gains--many still in use--that were revitalized by the Works Progress Administration, Civilian Conservation Corps and other agencies of President Franklin Delano Roosevelt's New Deal. Born in Santa Monica and raised in Huntington Beach, California, Charles Epting is an undergraduate student at the University of Southern California. He is studying history, geology and environmental studies and for several years has been a volunteer at the Los Angeles County Museum of Natural History, studying paleontology. He is the author of "University Park, Los Angeles."